This is the image they are showing on Arab television. The image was captured on a mobile phone camera by French photographer Philippe Desmazes for Getty. He was reportedly shot once in the head and once in both legs. Former Libyan leader Muammar Gaddafi died of wounds suffered on Thursday as fighters overran his hometown Sirte. Gaddafi reportedly shouted, “Don’t shoot!” before he was killed. TIME Live reported Gaddifi was captured and killed today in Libya. 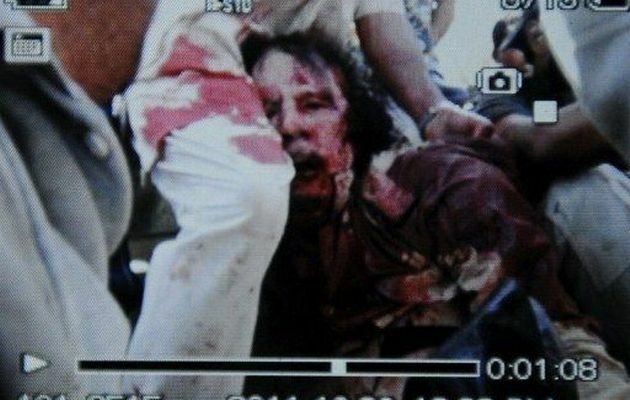 UPDATE: GRUESOME VIDEO– Gaddafi captured alive, beaten bloody and shot dead by militants.